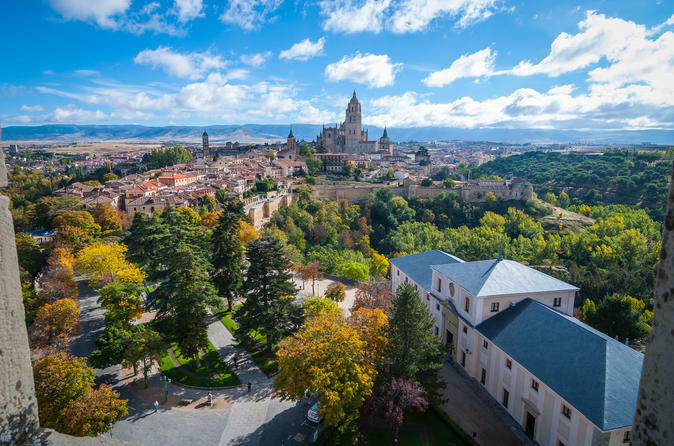 While you are in Madrid, don’t miss the chance to visit Segovia on a private 9-hour guided tour where you can admire the main attractions of this city, one of the most visited in Spain. You may choose your own departure time, we recommend to start at 8:30am. You can choose if you want to enter the Royal Palace of La Granja de San Ildefonso, the tour guide will guide you through Segovia and give you a complete guided tour. Segovia is a UNESCO World Heritage City, featuring a range of unique monuments that make it well worth a side trip from Madrid. This guided route will allow you to get to know the city in one day. Depart from Madrid at the Plaza Las Ventas in a private van, driving for an hour and a half to Segovia. Start by visiting Segovia's Royal Palace of La Granja de San Ildefonso, also known as “La Granja”, where you can explore the building and its gardens (entrance fee at own expense). You will be at La Granja for about two hours. You will also visit the Alcazar, check out the city's famous Roman-era aqueduct, and get a panoramic view of the Cathedral of Segovia and San Martin’s Church. In between your visit to La Granja and the tour around Segovia, you'll also have some free time to enjoy a traditional lunch on your own, just follow the recommendations of our guide. You will then have free time to walk around the streets of Segovia and enjoy the area by yourself. While you walk through the streets you will get to know the aqueduct, which was about 15 km long and supplies water near the actual marsh of Revega. The Azoguejo Square is the best known and best preserved area. At the end of the tour, you will return to the Plaza Las Ventas.